Small changes to an initial intention can cause a chain reaction that leads to large changes and eventually a completely different end result – the butterfly effect. This happened to me recently as I entered an H-Mart. If you’ve never been to an H-Mart, it simply is a moral imperative as a foodie, let alone for the shear cultural experience. On this occasion in Burlington Massachusetts, it was a cornucopia of culinary bliss. I have been to many markets across the globe, but this particular market inspired me intensely, and instantly changed my well defined plan and altered course for something completely different. I was fervently on the hunt for fresh sea bass – something wrongfully un-findable in most markets – but as fate would have it, was in abundance at this H-Mart, along with fluke, halibut, mackerel, flounder, skate, and monk fish to name just a few. However, like walking into a bar without intention and locking eyes with that special someone that will eventually be your soul mate, a beautiful fresh cut of Hamachi (Amberjack) called my name, and my original plan was out the window. It was like a fireworks show of inspiration. After liberating the perfect cut of Hamachi, I stumbled into fresh quail eggs and salmon roe just then pulled from a whole salmon. Fresh was the secret ingredient in this recipe, and the end result most gratifying. With a simple dressing, and some patience for the cucumber that I started a few days earlier, this dish delivered. 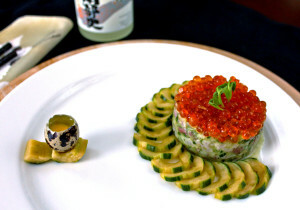 Quail egg optional, but like any respectable tartare, dare to pour it on top and add additional creamy finish and delight. Mix ingredients for dressing and toss with Hamachi, then chill in freezer for 5 minutes. With a vegetable peeler, peel cucumber every half inch to make green and white strips. Cut in half lengthwise and scoop out seeds. In a small bowl, stir miso, garlic, and sake until combined completely. In a small container, spread some miso mixture, then layer the cucumber spreading more miso mixture to completely cover cucumber pieces. Cover and refrigerate for 1-3 days. Remove from container and rinse in cold water. Cut cucumber into quarter inch slices. This entry was posted in Appetizers, Cooking, Main Dishes, Summer and tagged Fish, Seafood by cfaust. Bookmark the permalink.